[148 Pages Report] The global PDX models market is expected to reach to USD 167.6 Million by 2022 from USD 68.0 Million in 2016 at a CAGR of 16.7%. The growth of the overall Patient Derived Xenograft Models Market can be attributed to the growing demand for personalized medicine, continuous support for cancer research from the public as well as private sectors, and growth in the number of R&D activities in the pharmaceutical industry. In the coming years, North America is expected to account for the largest share of the global market. Base year considered for the report is 2016 and the forecast period includes 2017–2022. To track and analyze competitive developments such as partnerships, agreements, alliances, joint ventures, collaborations, product launches, expansions, acquisitions, grants/funds, and licensing agreements, among others in the patient derived xenograft models market. The various players in the PDX models market include Crown Bioscience Inc. (US), WuXi AppTec (China), Champions Oncology, Inc. (US), The Jackson Laboratory (US), ONCODESIGN (France), Charles River Laboratories International, Inc. (US), EPO Berlin-Buch GmBH (Germany), Shanghai LIDE Biotech Co., Ltd (China), Xentech (France), Horizon Discovery Group PLC (UK), Urolead (France), and Explora BioLabs (US). 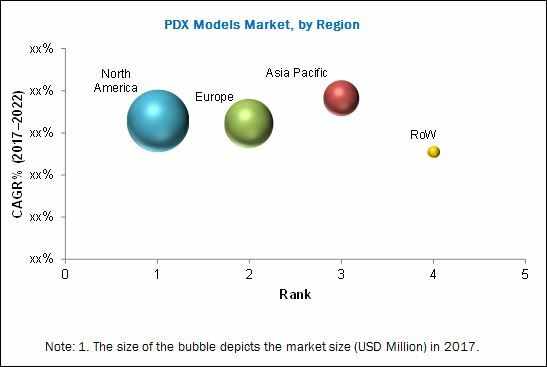 The global PDX models market is expected to reach USD 167.6 Million by 2022 from USD 77.4 Million in 2017, at a CAGR of 16.7%. The growth of this market is majorly driven by the growing demand for personalized medicine, continuous support for cancer research from the public as well as private sectors, and growth in the number of R&D activities in the pharmaceutical industry. However, the high cost of personalized PDX models and stringent guidelines regarding the ethical use of animals in cancer research are expected to restrain the growth of this market during the forecast period. The report analyzes the patient derived xenograft models market by type, tumor type, application, end user, and region. On the basis of type, the market is segmented into mice and rat models. The mice models segment is estimated to command the largest share of the global market in 2017. The rat models segment, on the other hand, is projected to register the highest CAGR from 2017 to 2022. Growth in this market is mainly driven by the larger size of rats, which enhances surgical manipulation. The development of immunodeficient rats will drive the usage of rat models in PDX model generation. Based on tumor type, the PDX models market has been segmented into gastrointestinal tumor models, gynecological tumor models, respiratory tumor models, urological tumor models, hematological tumor models, and other tumor models such as head & neck tumors, sarcoma, and melanoma. In 2017, the gastrointestinal tumor models segment is expected to account for the largest share of the global market. Based on application, the PDX models market has been broadly segmented into preclinical drug development & basic cancer research and biomarker analysis. 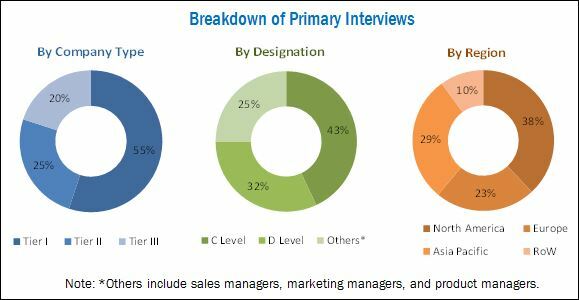 In 2017, the preclinical drug development and basic cancer research segment is expected to account for the largest share of the global patient derived xenograft models market. Growth in this segment is mainly driven by the increasing number of research activities in the field of oncology drug research. On the basis of end user, the PDX models market has been segmented into pharmaceutical and biotechnology companies, contract research organizations (CROs), and academic & research institutions. The pharmaceutical and biotechnology companies segment is estimated to account for the largest share of the patient derived xenograft models market in 2017. The large share of this segment is due to the increasing expenditure on R&D by companies for drug development. Geographically, in 2017, North America is estimated to account for the largest share of the global PDX models market, followed by Europe. Growth in biomedical research in the US, rising preclinical activities by CROs and pharmaceutical companies, and growing stem cell research in Canada are the major factors expected to drive the growth of the market during the forecast period. The various players in the patient derived xenograft models market include Crown Bioscience Inc. (US), WuXi AppTec (China), Champions Oncology, Inc. (US), The Jackson Laboratory (US), ONCODESIGN (France), Charles River Laboratories International, Inc. (US), EPO Berlin-Buch GmBH (Germany), Shanghai LIDE Biotech Co., Ltd (China), Xentech (France), Horizon Discovery Group PLC (UK), Urolead (France), and Explora BioLabs (US). 12.4 Charles River Laboratories International, Inc.